Ok, ya’ll know this is not a gossip blog so if you need your daily dose of gossip – go to TheYBF.com – they will have you in stitches and keep you up to date about all the fabulous-ness going on in Black Hollywood. My favorite Atlanta Housewife, Lisa Wu-Hartwell, showed up to the show’s premiere party looking absolutely RADIANT!! You know green is my favorite color and Lisa looks so pretty in this off the shoulder ensemble. Plus, her hair and make-up are on-point! Get it Lisa! 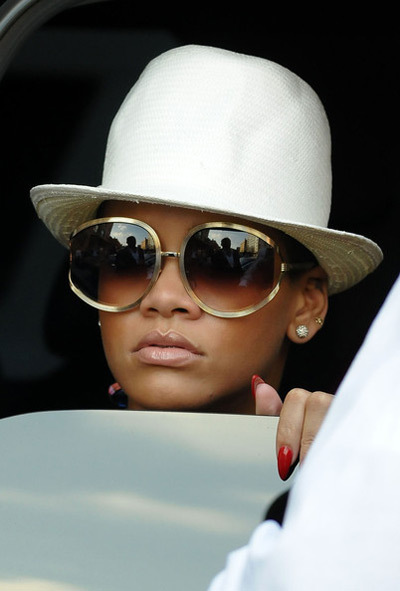 Always FAB for no reason, Rihanna, was on the way to lunch looking so casual fab! The sunglasses, the fedora, simple earrings, and red nails are just so . . . nice. Now I’m sure the items worn in this pic can pay my rent for 3 months, but hey, it’s Rihanna, what chu’ expect. Click here for Rihanna’s recent NYC catwalk – basically chick has been walking around NYC, looking FAB, and going to ‘meetings’. Whatever – Live Ya LIFE!! “You waste potential relationships focusing on fear.” - I just text this to a fellow influencer who is worried about releasing new content. - - As a #SocialMediaMentor, the biggest hurdle I discuss is FEAR! True, the digital space ain’t for the weak. Planning & Preparation are keys to success. BUT, not moving forward because of perfectionism is blocking the world of the BLESSING you are. - - The world needs to hear your message! Move forward!